Have you ever had a thrilling adventure of flying through the air at speeds topping 40 miles per hour, flying like a bird over the Blue Ridge mountains? Now you can! Our zip line canopy tour consists of many tree top sky towers, ziplines, suspension bridges, and a cargo net located in the tops of a Southern Pine Forest. You can zip, walk, and climb your way through the fun filled tour. Don’t worry, you are safely harnessed and anchored in for the full tour. Ocoee Canopy Tour is the only zip line canopy tour with views into the Cherokee National Forest, home of the Ocoee River and Rafting! Ocoee Canopy Tours is located just minutes from Blue Ridge Georgia. Pair your trip with a rafting trip and get a HUGE discount on the combo!! Ask our friendly reservation staff for details!! Each customer’s equipment including helmets, full body harnesses, trolley, gloves, 2 safety lanyards, and 2 to 3 guides depending on your groups size. Our experienced guides will lead you through the tour for a fun filled adventure that anyone can enjoy. No experience is necessary! 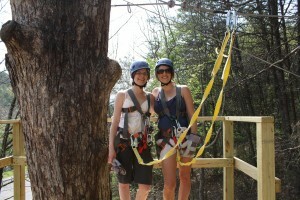 Anyone from 70lbs (yes we do weigh you) to 250lbs or 70 years young can enjoy Ocoee Canopy Tours. P.S. Great pic’s as well.